Over the last few months, I’ve been working with companies new and old to help them discover and understand their brand personality so they can better engage their audience. Now, I see a lot of the same patterns when talking to clients whose brands need a little work. They believe that they’ve got a strong brand because they have a logo, colors, and marketing strategies and paraphernalia. But a brand is so much more than that. 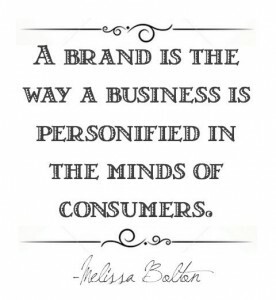 Your brand is the personification of your business. If your business was a person, who would it be? What would he or she (or even it) look like? How would she or he behave? What causes would he or she support? What would she or he do on the weekends? When it comes to defining your brand personality, it’s all about differentiating yourself and staying consistent within your industry and adapting to the changes and challenges you’ll face, all while maintaining your identity. There’s a quote from Judy Garland that says, “Always be a first rate version of yourself and not a second rate version of someone else.” Branding is not about creating a false identity. Authenticity is arguably the most important part of your brand personality. It should reflect your company culture. This kind of truthfulness and dependability is what makes everyday people like you and I trust one brand more than another. Discovering your brand really comes down to evaluating yourself as a business. How do you handle yourself with customers? Are you light-hearted and funny? Do you have a more serious demeanor? Your brand should make sense for your company, not your industry. Even if every other company in your industry markets their brand a specific way, it doesn’t mean you have to follow suit. Sometimes it pays to be different, but only if that’s who you are. By understanding your company culture, you’ll be able to more clearly define the message you want to send, the impression you want to make, and what it is that makes you different. It’s also a great way to avoid sending mixed messages and confusing people. You don’t want to come across as a company with a split personality. So if you’re struggling to identify and build your brand, the first place to start is by asking yourself a few questions and taking the time to answer them carefully. Don’t be shy about asking your coworkers for their input. We’ve done this ourselves and can tell you that it may not be easy or fun for everyone, but I can guarantee that it’s worth the effort when everyone can finally agree upon a coherent and cohesive brand personality. It’s been said that before you can love someone else, you have to love yourself. It’s no different with branding. Before you can really understand your audience (and thereby make yourself irresistible to them), you must understand yourself. What drives you? What’s your motivation, your passion? If it’s purely profit, this is going to be a short exercise. Think beyond the bank and tap into a deep-seeded need, emotion, or desire. Maybe there’s an event in your past that drives you. Acknowledge your weaknesses. A jack of all trades is a master of none. So acknowledge your weaknesses, but focus on your strengths. What are you good at? It doesn’t have to be anything grandiose. Sometimes you’ll identify a niche with needs that no other company is serving. The truth is that everyone has a little bit of all these things inside them. No one is purely this or that. All you need to do is figure out which is more dominant in your personality. I’d personally suggest this test from HumanMetrics, which is an online version of the Jung Typology test I just mentioned. I recommend answering as your company, rather than yourself, but either way you do it will work and give you a bit of a baseline. Once you complete the test, HumanMetrics will give you some really great descriptions that can help you discover a bit more about yourself. There’s even a list of famous folks who have (or are assumed to have) the same personality type as you, which can maybe give you a better understanding of your personality and image and how best to portray it. I even had a couple of my coworkers take the test and we compared our compatibility. When creating your “personality profile,” as I’d call it, also consider your experience, your background, your “how we came to be” story, hobbies and interests, core beliefs (aka: morals), what makes you uncomfortable, your message, level of commitment, what keeps you awake at night, etc. Copyblogger has a great list of questions that go into far more depth, so you may want to check that out, too, and treat it like an exercise. Don’t Dare to be Different, Dare to be You! Remember a “bad” personality is better than no personality. Think Axe, Abercrombie and Fitch, Dos Equis, Bloomingdales, Harley Davidson, Slim Jim, Chanel, Armani. While outsiders may see them as sexist, crude, pretentious, obnoxious, immature, overly-manly, or a mix of any of these, it works for them. Sometimes being exclusionary makes people want in. So while some people are put off by these companies, each of them has still managed to build a vast and loyal following by being themselves, staying true to who they are, and fostering a company culture that reflects their brand. Ultimately, having a strong brand isn’t about being fake or playing into stereotypes. It’s about being you and finding a way to make that appealing. If you’ve tried taking the tests and brainstorming with your team but are still having trouble getting your company’s personality nailed down, give Optimum7 a call. We’ll not only work with you to discover and better define your brand, we can also help you build it and create designs and marketing strategies that reflect it.